In the life of every collector of old photographs or of a family historian, there comes a defining moment. A moment when what you've always known in your heart, that this is what you were meant to do, becomes a reality. That defining moment came for me yesterday, April 30, 2008. This year I started the digital publication Shades Of The Departed to write about my passion for collecting old photographs and how analyzing those photographs can fill in our family history. Every week I post a Photo Of The Week, one of those "orphan photographs" I buy on my many trips to flea markets, second hand stores, antique shops and auctions. One of my first Photos Of The Week featured what is my favorite photograph in my private collection, the little girl wearing pearls. I was captivated by her from the moment my daughter brought her home to me. I would like to think that this connection was her reaching out from the past, urging me to find her family. I analyzed the photograph and researched the name written on the back "Mary Irene Brunton Reynolds." I found the little girl had been married to a part of Northwest History - Edward "Tige" Reynolds, a famous political cartoonist. I wrote about what I had found. There was more information concerning "Tige" Reynolds that I didn't include, because the focus was on the little girl. Every Reynolds' cartoon carries the image of a little Tiger. It is from this Tiger that Reynolds gained his nickname "Tige." It was from the Reynolds' Tiger that the Tacoma baseball team gained its name. All the information I have gathered I will make available to the family. Today I was looking for some cartoons of Edward Reynolds, and to my shock I came across your website. 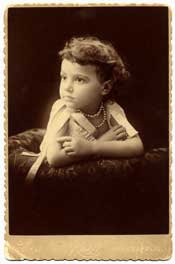 I am the great-great granddaughter of the little girl in the photo posted (Mary Irene Brunton Reynolds). My name is Krista Reynolds; I am the daughter of Stephen Reynolds (who you mention in the analysis). I don’t know how you obtained the Brunton/Reynolds lineage but I am ever so grateful. We have lost everything in regards to our family due to unfortunate circumstances and I know nothing of my history. I am almost in tears to know you have found such detailed information. The handwriting (I would know it anywhere) on the back of the photo is from my grandmother, Winona Reynolds who was married to Edward Brunton Reynolds. Both Edwards shared the nickname “Tige”. I know this is in your private collection, but I would be ever so honored if I might have the photo or at least a copy. Hello, my name is Linda Reynolds, wife of Stephen Edward Reynolds who is the son of Edward "Tige" Brunton Reynolds and Winona Dodson Reynolds. Our daughter Krista Reynolds, was playing on the internet and occasionally inputs family names to see what might pop up. Today was quite a suprise. All family photos were lost when Winona "Nonie" took ill and a distant relative came to the home and took anything of value. A very sad event as Steve is left with no family photos. Living in the Seattle area, you may recognize the name Steve Reynolds from Unlimited Hydroplane racing. He was the driver of several boats including the Circus Circus, 7-11 and Cellular One. Steve was injured in a racing accident in Madison Indiana in 1986. The writing on the photo is that of Winona. She kept very accurate records. If there would be any opportunity to recover this one family photo from you I would be very grateful. Did you only recover this one photo or might there be more?. . . I love this photograph, it is my favorite, but the "little girl wearing pearls" belongs to her family. I have just been her guardian. Thank you so much for writing back! I was literally in shock when I came across your site. I randomly search Google for family history, and very rarely to I find anything! Especially on Tige! And it’s so funny to see Mary’s photo because I can instantly see a resemblance to myself. I’m so happy to know you had a connection to her. From what I hear she was an amazing lady. And you are amazing yourself. What you do for people, finding old photos, reconnecting is wonderful. And to know what a joy it is to solve a mystery! Thank you so much for what you have done. I truly mean that. My Grandma Nonie (Winona is her real name), has very distinctive handwriting, that’s how I knew it was hers off the bat! She will be turning 93 on May 7th! I never knew Grandpa Tige. He died when I was only a year old. I wish I could have known him though. So my "little girl wearing pearls" will be reunited with her family. Hopefully in time for Nonie's 93rd birthday. Mary Irene Brunton Reynolds will be Going Home! What an AMAZING STORY! As family historians, we have all felt that sad sweetness at coming upon orphaned photos in antique shops, yard sales, and heaven forbid, even on restaurant and truck stop walls... How could someone abandon these people to oblivion? You truly have found your calling, and with great finesse, I might add. Congratulations for making "The Match!" I AM in tears reading this beautiful story of photo-reunion. I hope that Krista will share a photograph of herself with you so we can all see the family resemblance. Well done! Wow, fM, that is wonderful! Ain't the 'net great? I can understand why it is your favorite photo in your collection. It is so nice that you are willing to give it up even to family. I'm sure Nonie will have an even happier 93rd birthday now. It's events like this that make blogging so worthwhile. I like the idea of you getting a picture from the family so you can do a follow-up on the story. And I am with you: we are just caretakers of these items be they photos, letters or census data. They are only ours to blog about, write about, discuss, and to try and bring a spotlight on them so others can appreciate their value. Yes, what a defining moment!This surely is a moment that underlines one of the reasons many of us do what we do. Congratulations! Wow! What a fantastic story! I'm ready to run out to our local antique store and buy all the old photos in there! You are truly inspiring, fM. May more of us follow your example. Such an awesome story! It's something we all dream of happening to us but it is ever so much sweeter when we can actually be the one helping someone else! Maven, Your story just made all our hearts get a size bigger. Thank-you for being YOU, fM. Your love for humanity knows no bounds. I am inspired by this story, and can barely type through my tears. They are TEARS OF HJOY for for the gift of family that you have provided to the descendants of the girl with the pearl necklace. You have given the most wonderful gift to the descendants of this little girl. I'm so thankful that they were able to find out that little Mary was in your care by way of the internet. I have beautiful photos of a few branches of my family, but there are several of which I have almost nothing. So often I wish that I could just find one old photograph to give me a glimpse into the lives of these ancestors and/or to see if someone in today's generation has a family resemblance. Thanks for providing this gift to the family of the girl with the pearl necklace. I share their excitement and gratitude to you for bringing her photograph "back home" to them again. I recently found a photo of who we believe to be my Great Great Great Uncle Bert (who moved to Canada in 1904) on a website and I'm awaiting the historical societies scanner to work so I can have a higher resolution copy to show my Nan. I have asked Nan is we have any photos of him... She remembers a couple of photos of him, but they went to another member of the family and she doesn't know what happened to them. I would be thrilled if they turned up just like this one did! It is amazing how things happen. I can imagine Mary Irene Brunton Reynolds whispering in your ear, "thank you." And I hear you say, "You're welcome, but it's what I do." This is a wonderful story. I'm happy that the family will be able to recover this photo through you.